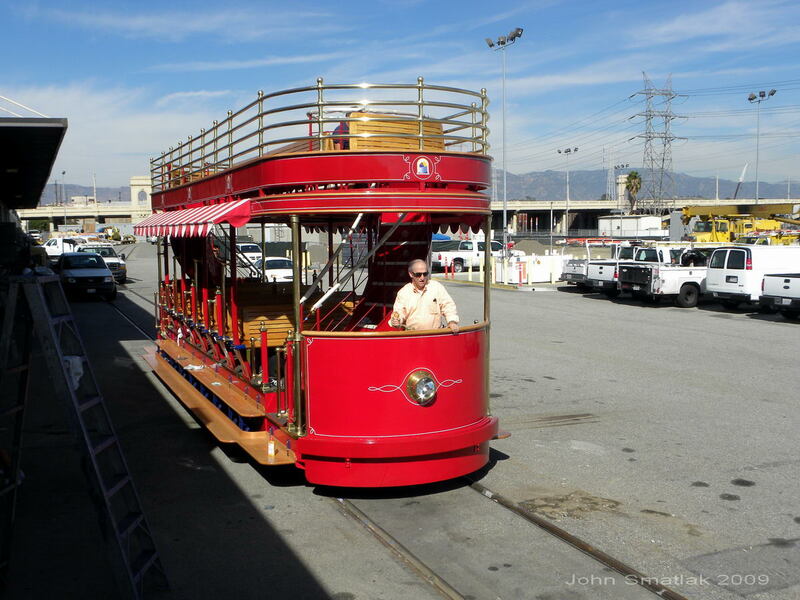 One of the more interesting variants on the Vintage Trolley concept is the battery powered trolley which has been in service at the Grove at Farmer’s Market in Los Angeles since 2002. 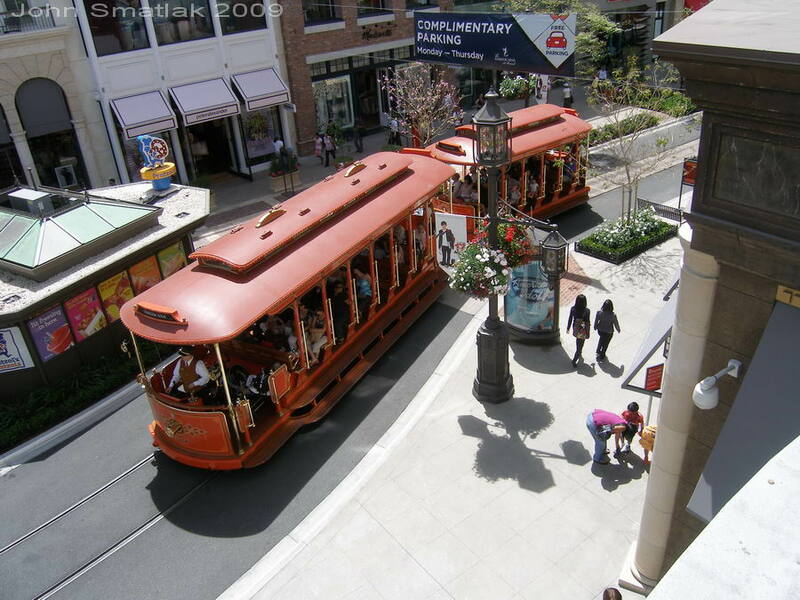 Created by TIG/m, the double deck vehicle is not based on any particular prototype, but created to be an attractive and easily accessible people mover within a very large outdoor shopping area. The line connects the historic Farmers Market outdoor marketplace with the large “Grove” shopping mall immediately adjacent. 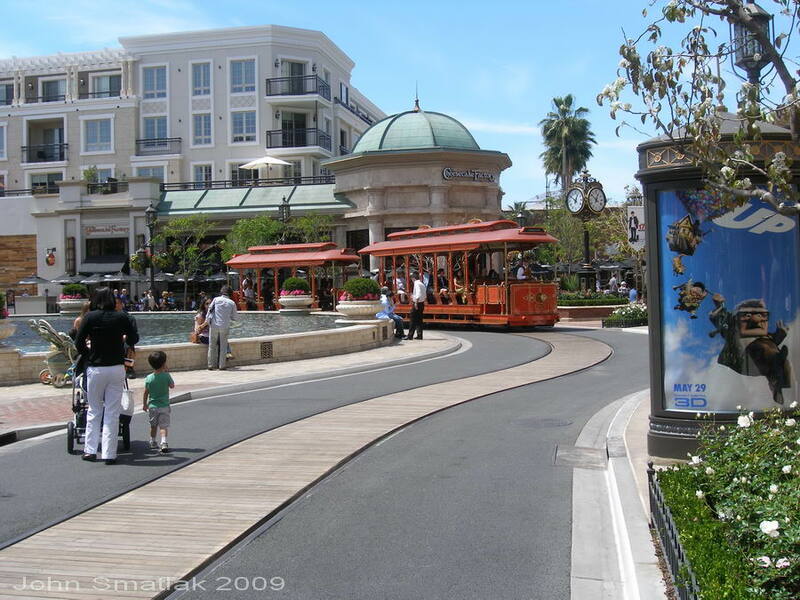 The open-air mall is arranged around a themed streetscape, and the 1,200 ft. trolley line winds its way through several blocks of stores, restaurants, a large theatre complex, and a 3,500 space parking garage. 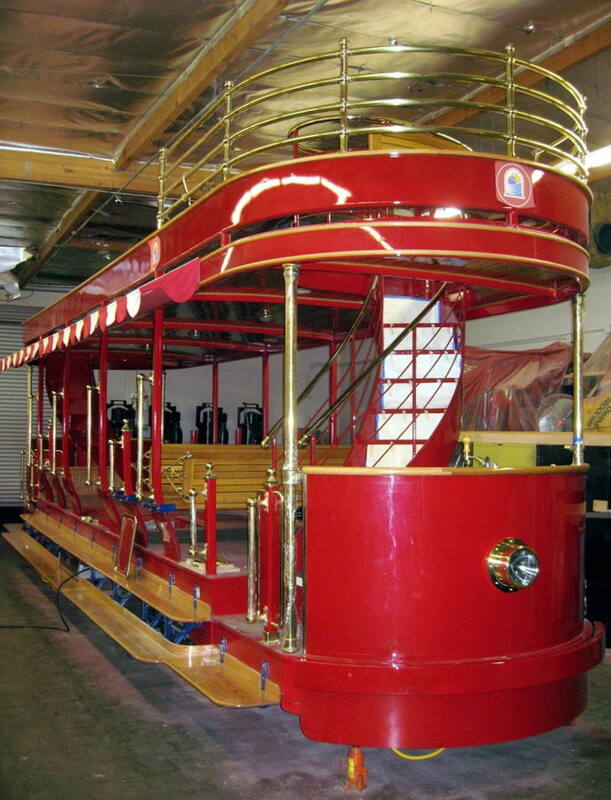 The line’s single battery powered trolley operates seven days a week and carries patrons free of charge. Top speed of the vehicle is limited to about 8 mph in deference to the pedestrian intensive environment. 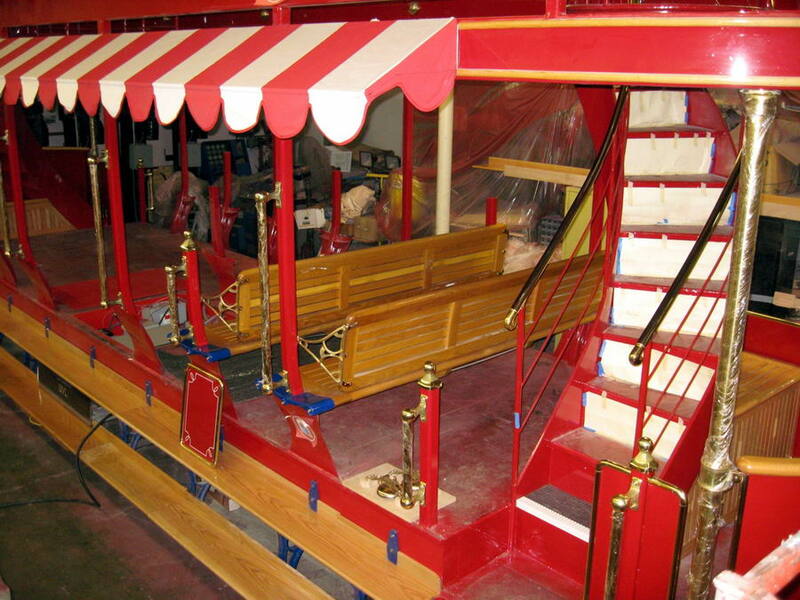 The trolley operation commenced in February 2002, and has exceeded expectations for both ridership and reliability. The car runs 8-10 hours a day, seven days a week and is rarely empty. During the occasional heavy rains that occur in the winter months, the car is withdrawn from service, but otherwise its fully open design is the perfect match for the area’s mild climate. 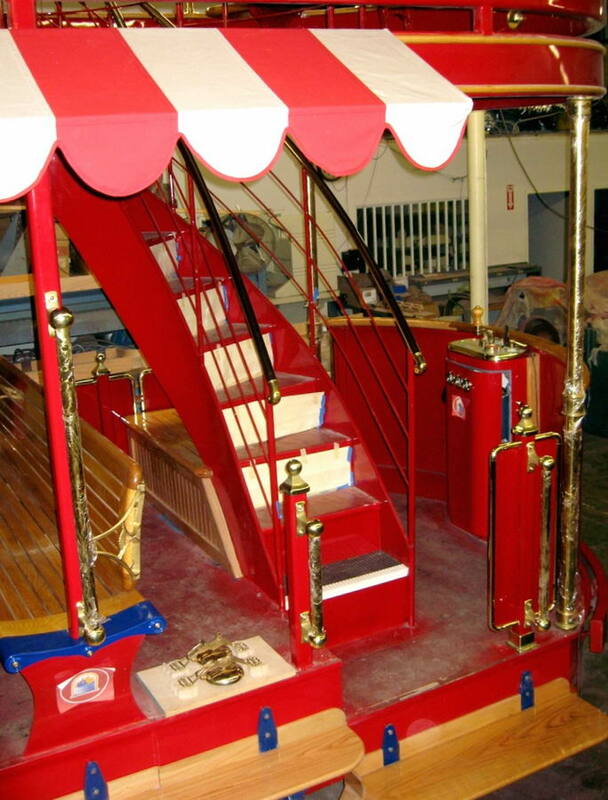 Farmer’s Market receives about 3 Million annual visitors, and the trolley is currently carrying about 730,000 passengers annually (although an estimated 830,000 rode in 2003). 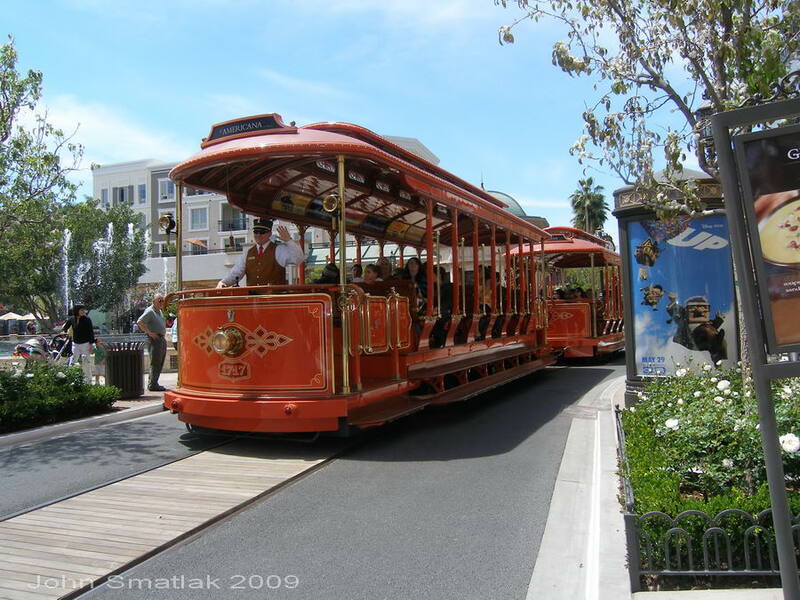 Not surprisingly, the trolley also incorporates large advertising panels which serve as a revenue stream for the mall’s operators, managed by a large outdoor advertising firm. 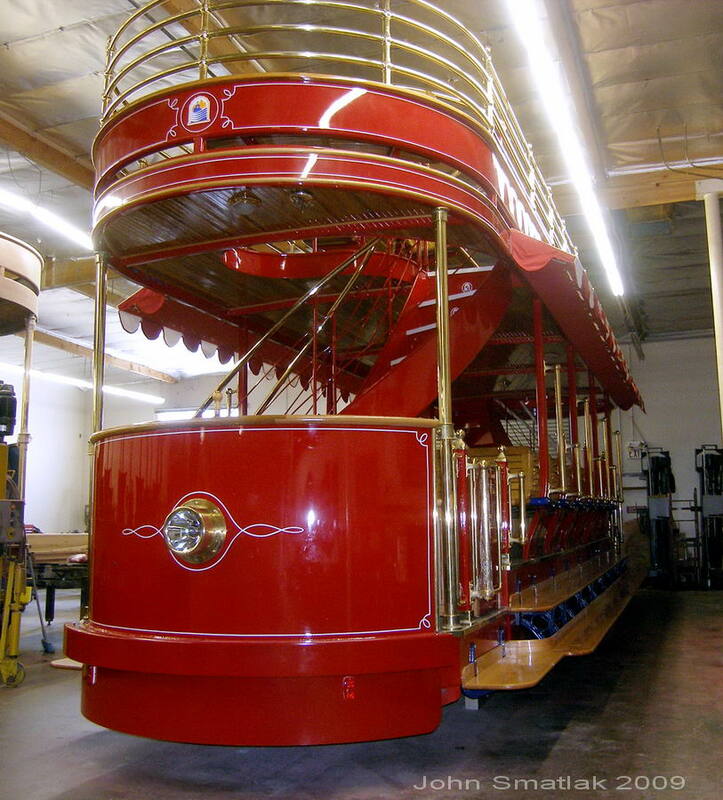 The vehicle uses refurbished PCC streetcar trucks and an all new steel-framed carbody. Regenerative braking is utilized to recharge the batteries while enroute, and the system has also been fitted with Wampfler inductive charging apparatus for “opportunity charging” at one end of the line. This system allows the batteries to receive a quick “topping off” without being plugged in. The batteries receive a heavier charge each night while the vehicle is plugged in inside its storage bay. quite popular with the passengers. the Farmer Market end of the line. 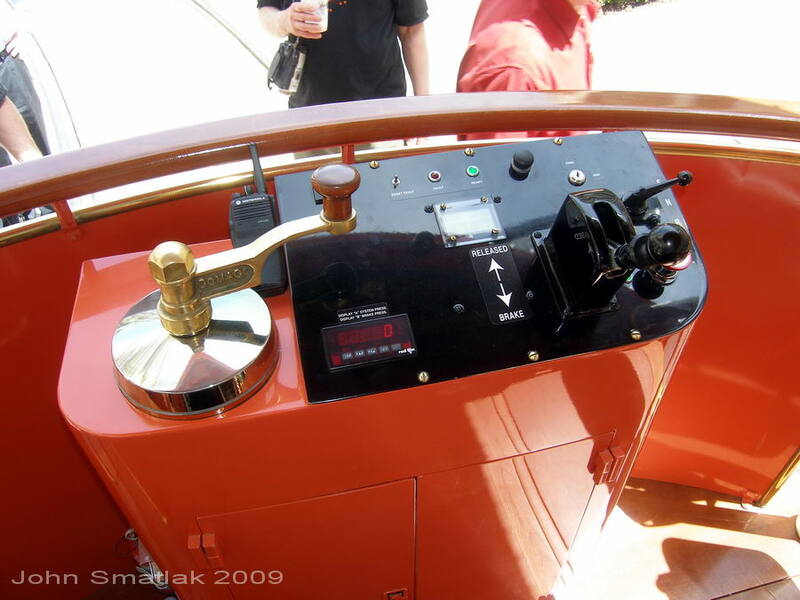 PCC streetcar trucks are used for the running gear. TIG/m has produced two additional vehicles for an operation at the new Puerto Los Cabos Marina in Baja Mexico, as well as a third vehicle for a new operation in Texas. 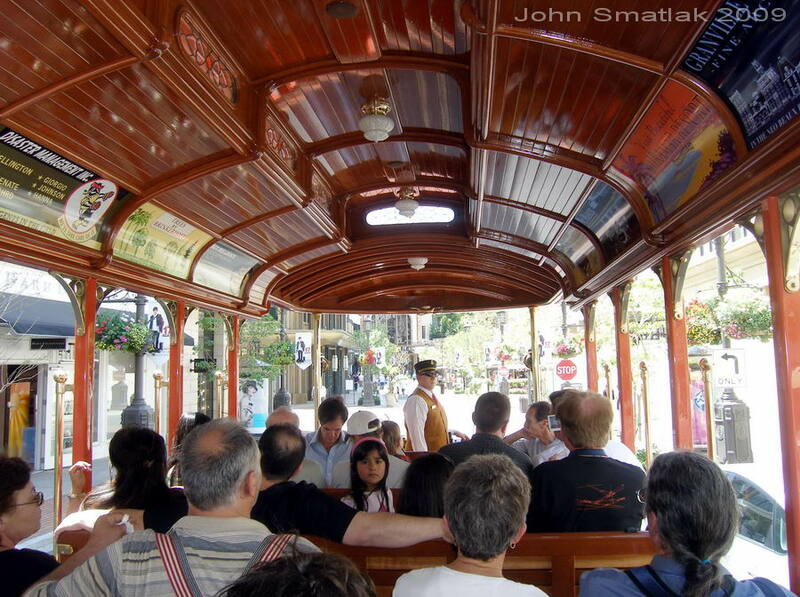 The new vehicles are being manufactured in the Los Angeles area, and the cars for Mexico feature the same basic double-deck architecture as the car at Farmer’s Market, although with a different theme. 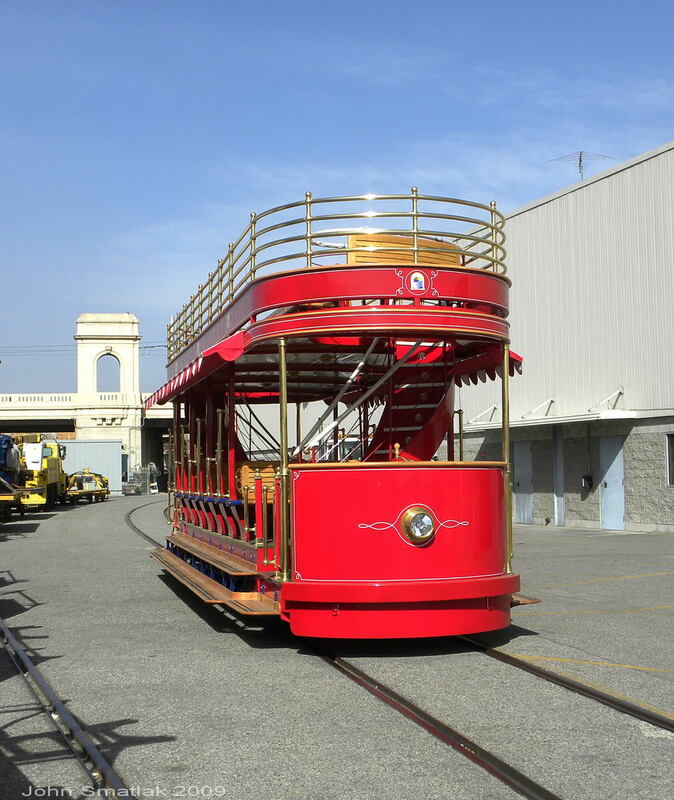 All of the cars are equipped with refurbished PCC trolley running gear, and also feature a small on-board generator to permit battery charging enroute. 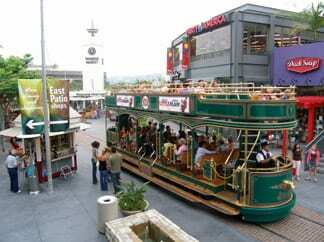 The Gomaco Trolley Company has built a pair of battery powered cars for the Americana at Brand shopping mall in Glendale, California. 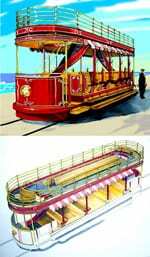 Other battery powered trolleys/trams now in operation include the tramway at the restored Southport Pier in the UK. 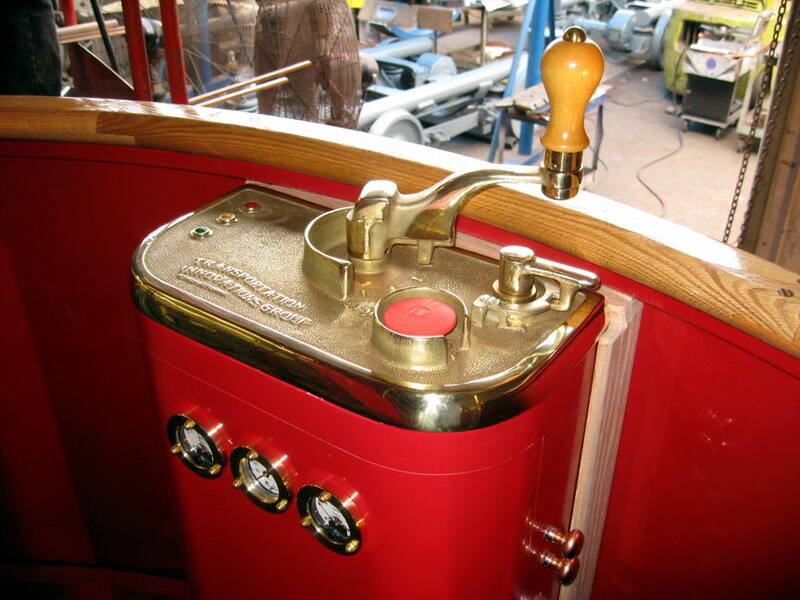 This unique 3′ 6″ gauge operation began in 2005, using a modern vehicle constructed by U.K. Loco LTD. The use of batteries is also increasing for supplemental propulsion in light rail vehicles. Vehicles in both the United States and Europe are being fitted with batteries to provide the capability of making short moves “off wire”. In some cases the batteries are intended only for short moves to navigate past interruptions in the overhead contact system or in maintenance facilities. In other cases, such as on Alstom’s Citidas trams for Nice, France, battery power will allow the line to routinely traverse two 500m segments through historic town squares without overhead wire. In the UK, the Sustainable Transport Company (Sustraco) is developing an “ultra-light rail” system capable of being powered by a range of energy sources. for the Puerto Los Cabos Marina. 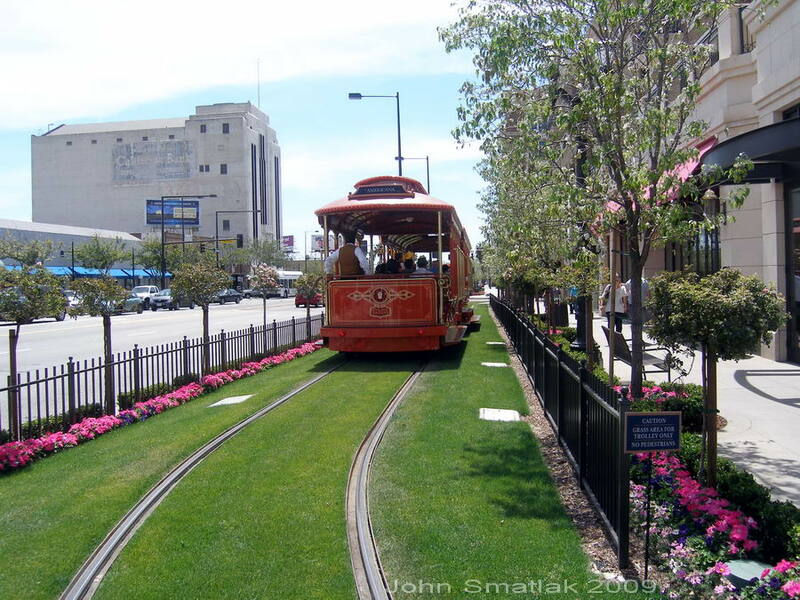 Update May 2009– In April, Los Angeles played host to the APTA/TRB Joint Light Rail Conference. 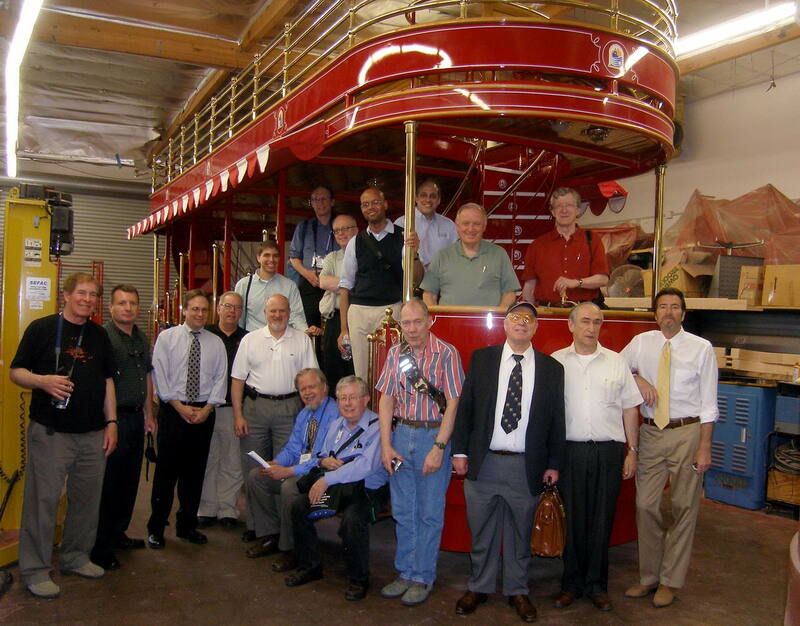 As part of the conference activities, the APTA Streetcar & Heritage Trolley Subcommittee offered a “Battery-Powered Streetcar Circulators” tour. 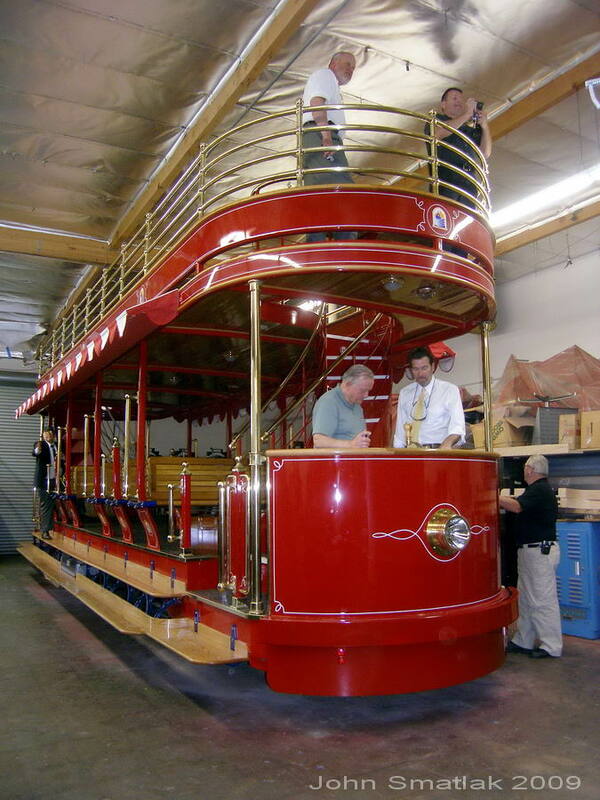 Participants visited the Gomaco-manufactured car set at the Americana at Brand in Glendale, and then traveled to Canoga Park to visit the facilities of vehicle manufacturer TIG/m. 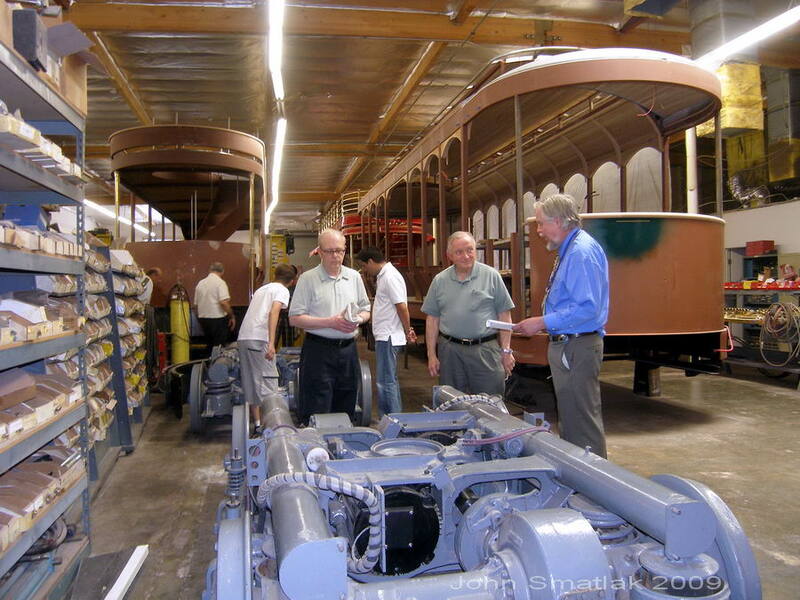 There the group saw a presentation from TIG/m about current and future streetcar projects and also got a hands-on look at the three vehicles presently in their shop. Pictures of the tour follow below. 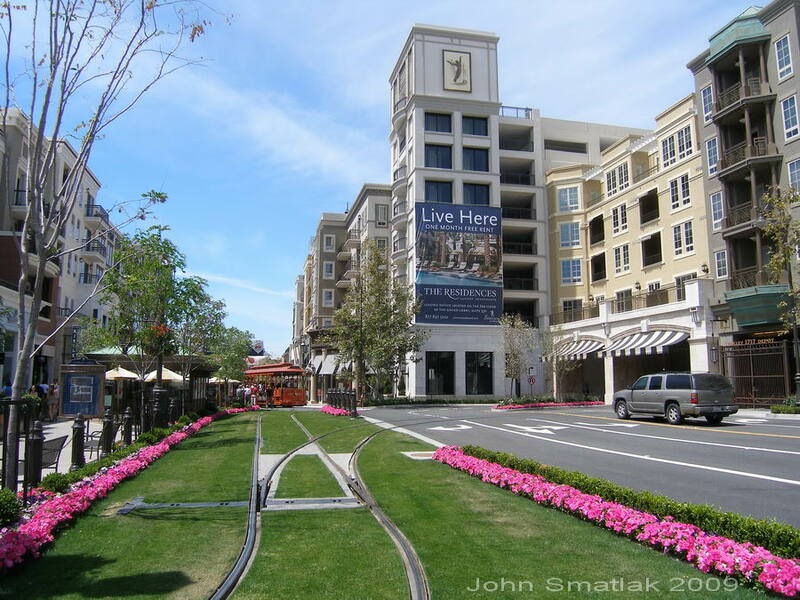 at Brand is a project of developer Rick Caruso. 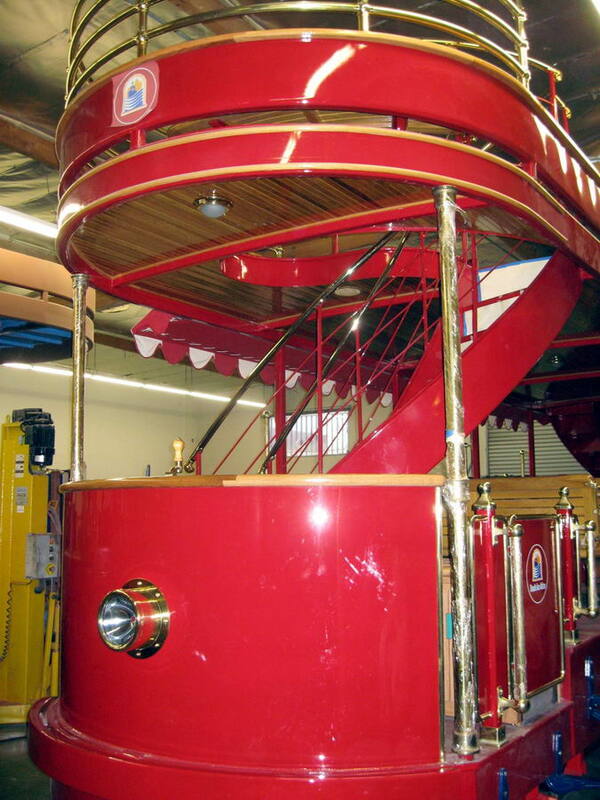 vehicles were manufactured by Gomaco in 2008.
manufactured at TIG/m in Canoga Park. been fitted with new AC motors. complete, two other cars are under construction. supplemented with a small on-board generator. Subcommittee pose with one of the new TIG/m cars. 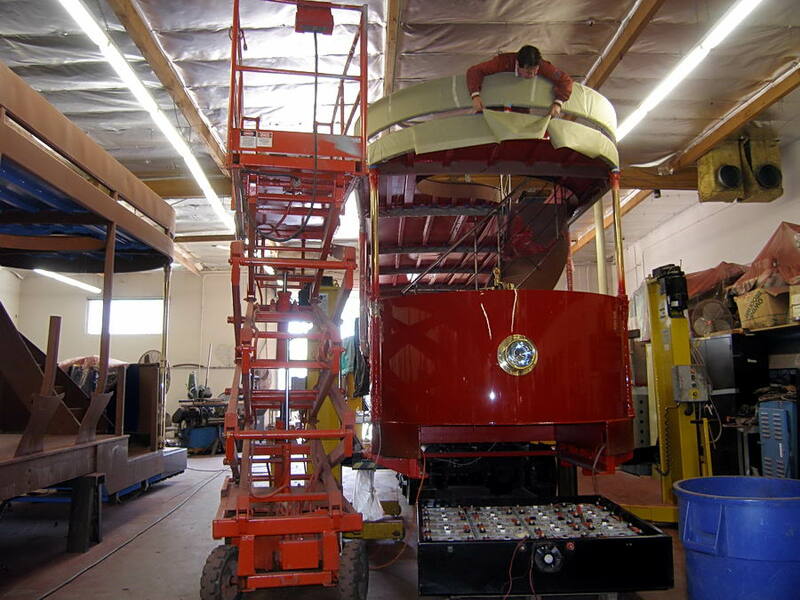 Update November 2009– TIG/m is currently testing the first of two streetcars for the Puerto Los Cabos project. LA Metro has provided the Los Angeles-based company with access to some isolated trackage that is part of its Red Line maintenance facility. TIG/m plans to showcase the car for approximately one month as it is put through its paces prior to being delivered to Mexico.